Brad Keselowski #2 Miller Genuine Draft Ford Fusion-Our first Bristol throwback is one of my favortes, the Rusty Wallace Miller Genuine Draft design. It worked well a few years ago, it stil works well. I give it an A.
Austin Dillon #3 Dow Energy and Water Chevy SS-The blue water motif works well, the black outline…not so much. Get rid of the black outline, and just have the water motif. It’s not a terrible scheme, and it deserves a C.
JJ Yeley #7 Accell Construction Chevy SS-Same scheme as 2015, but with a black hood, and the black hood is an upgrade, and takes the scheme from a C- to a C.
Reed Sorenson #15 Xchange of America Chevy SS-It’s a smooth look, with a great color scheme. It earns an A.
Ricky Stenhouse Jr. #17 Ford EcoBoost Ford Fusion-While I like the fact the design has been toned down, it’s still over designed, just less over designed. Good color scheme, but that can’t save this scheme from earning a D-. Ricky Stenhouse Jr.#17 Go Bowling Ford Fusion-Definitly a downgrade, from red, white, and blue to black, red and white. The design scheme could be better if it were a bowling lane motif. Still, it’s not terrible, and I give this a B-. Matt Kenseth #20 Toyota Toyota Camry-The color scheme could work it it was either gray or white, but the combination just doesn’t work. Add a design that doesn’t work well with the color scheme, and you have an F scheme. Chase Elliott #24 Little Ceasers/Mountain Dew Chevy SS-The orange scheme works well, I like the fact that the door number matches the orange. Add in a good design scheme, and you have an A scheme. Chris Buescher #37 Scott Products/Kingsford Chevy SS-Same scheme as Cottonelle, same A grade. 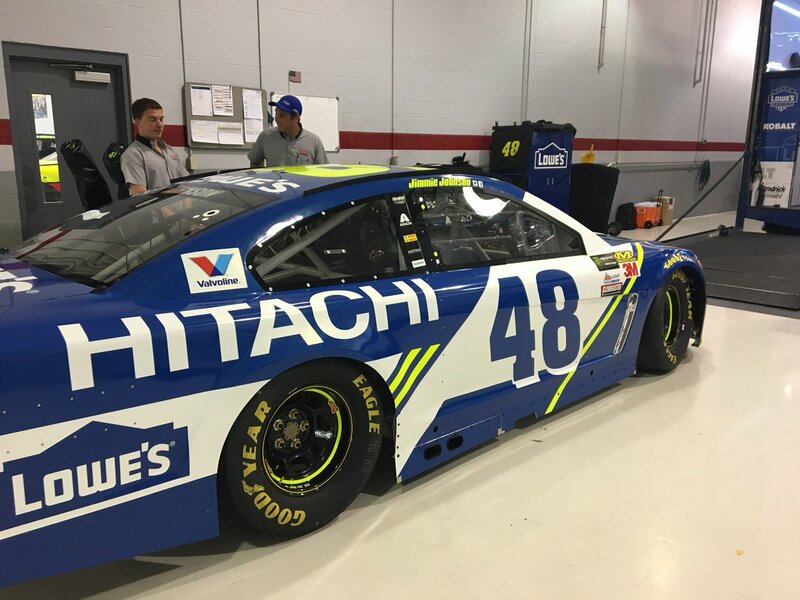 Jimmie Johnson #48 Lowe’s/Hitachi Chevy-Same scheme as Lowe’s, same F grade. Timmy Hill #51 Fenton Motors Chevy SS-Same scheme as Bubba Burgers, same A grade. Cole Whitt #72 RTIC Coolers Chevy SS-I like the lighter blue, and the carbon fiber hood works very well too. Even the #72 works well with this scheme. I give it an A.
Dale Earnhardt Jr. #88 Axalta/Philadelphia Eagles Chevy SS-The color scheme isn’t great, the black doesn’t work. The design is unoriginal, and doesn’t work with the color scheme, but it’s not horrible. I will give it a C-.